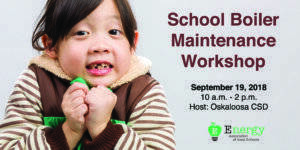 September 19, 2019 • 10 a.m. – 2 p.m. School Boiler Maintenance Workshop. Keep your students and staff warm this winter! Attend this face-to-face workshop for school facilities managers addressing: 1) Preventative maintenance, 2) Efficiency, traps and daily boiler room checks, and 3) Planned replacement vs. planned repair. FREE for school districts who are Energy Members of Energy Association of Iowa Schools. Just $49 for non-members. Lunch is included. Deadline for registration is September 17. Register Today! Feb. 20, 2019 • 10 – 11 a.m. Learning Webinar. Priority topic to be determined by EAIS members. April 24, 2019 • 10 a.m. – 3 p.m. MARK YOUR CALENDARS for the second annual Iowa School Energy Conference! Interesting location to be announced (last year we had it at the Iowa Speedway.) Free for EAIS Energy members and $49 for all others. Lunch is included. Registration begins March 1 with a limited space of 100 participants.